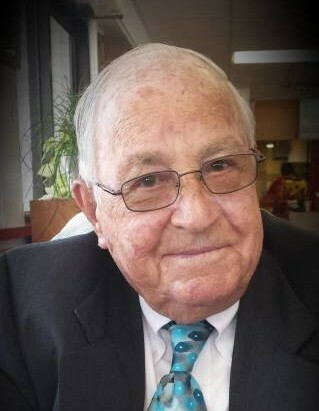 Melton McPherson, age 90 of Clarendon went to be with his Lord and Savior on Saturday, August 18, 2018 at the Lower Cape Fear Hospice Angel House in Whiteville. Final rites for Mr. McPherson also for his dedicated wife of 65 years, Edit Lea Hinson McPherson will be held at 11:00 a.m. Friday, August 31, 2018 at Beaverdam Original Free Will Baptist Church with Pastor Buddy Seay officiating. Interment will follow in the Hinson Cemetery. He honorably served his country in the United States Army as a member of the occupying forces in Japan and later in the Korean War (1950 -1952) and completing his service in the US Army Reserve in September, 1956. He was a lifelong member of Beaverdam Original Free Will Baptist Church, where he served as an Elder for over 43 years. He was a talented builder by trade and much of his work may has been seen in various churches, schools and businesses around Columbus and surrounding counties. He enjoyed hunting, fishing and spending time with his grandchildren and great-grandchildren. He was the son of the late Vanie Cartrette McPherson and Coley McPherson and was preceded in death by five siblings, Rossie McPherson, Eunice Hinson, J.C. McPherson, Hershel McPherson and Mildred McPherson. Survivors include his wife, Edith Lea Hinson McPherson of the home; a son, Michael Keith McPherson and his wife, Nancy of Whiteville; a daughter, Lisa Sellers Nance and her husband, Chris of Chadbourn; two siblings, Alene McPherson Cribb of Clarendon and Bobby McPherson of Chadbourn; grandchildren, Ashley Hayes (Lacy), Jennifer McPherson, Joshua Bryan Sellers (Megan), Michael Blake McPherson, Dylan McClain Sellers, Christopher Nance, Jr., Ben Nance; great-grandchildren, Ashton, Ayden, Bryson, Caige, Chesney, Parker and Paxton. Memorials may be made to Lower Cape Fear Hospice, 206 Warrior Trail, Whiteville, NC 28472 or to Beaverdam Original Free Will Baptist Church, 2665 Beaverdam Road, Chadbourn, NC 28431.